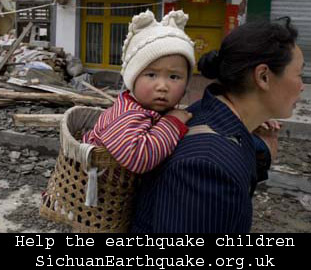 A year after a devastating earthquake, Sichuan province in China is still rebuilding. Many children remain separated from their parents. To raise awareness of victims still in need, folk musician Abigail Washburn and electronic artist Dave Liang spent two weeks in Sichuan to create Afterquake, an album that mixes actual sounds of the rebuilding with the voices of relocated school children. This entry was posted on Friday, May 29th, 2009 at 12:51 am	and is filed under News. You can follow any responses to this entry through the RSS 2.0 feed. You can leave a response, or trackback from your own site. this website and provides it a lookk on a continuing basis. sembra avere ancora tanta benzina in corpo. Le due ottime prestazioni in campo europeo contro il Barca hanno strappato il pass per il rinnovo. Tra i senatori, il primo che sar confermato. La maglia del Milan sembra averla cucita sulla pelle, come il suo dna a tinte rossonere. Soprattutto pu garantire affidabilit e compattezza all reparto di centrocampo. Seppure a fase alterna. Come vice Van Bommel (in caso l rimanga) pu tornare utile. Al momento le parti non si sono ancora accordate ma il rinnovo per il capitano non in discussione. In via Turati, a giugno, sar il primo a sedersi al tavolo con Galliani. I am glad for writing to make you know what a exceptional discovery our daughter encountered reading through the blog. She picked up lots of pieces, with the inclusion of what it is like to have an awesome helping nature to make others really easily grasp certain very confusing issues. You actually did more than her desires. Thanks for coming up with those warm and friendly, safe, edifying not to mention unique guidance on that topic to Tanya.